As an admin in Fileboard you can manage your Users, Teams and Profiles from under the Seats tab. To manage users click on Admin. Click on seats and then Users tab. To invite a user click on the + Invite User button. To manage an existing user click on the edit button under Actions. 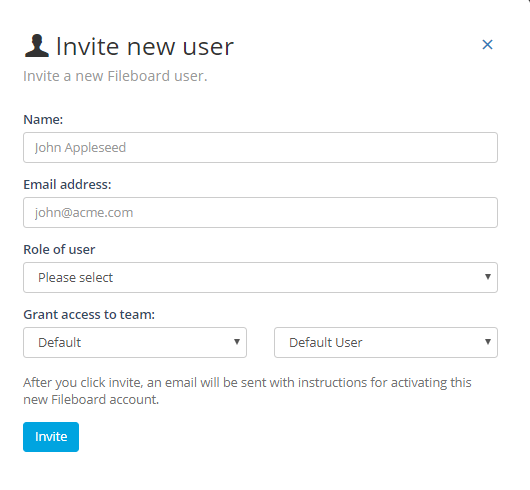 When you click on the + Invite User button (step 1, image 2) you can invite new users to Fileboard. You can do so by filling out the name, email address and role of the user and selecting the appropriate team and user access level and then clicking on Invite. To edit a user in Fileboard click on the edit button under Actions. Update the name and email address and change the password of the user if needed. When ready click on the blue Update button. Click on the Teams tab to edit team setting of the user. To revoke access from a specific team click on the Revoke button on the right. To Grant access to a specific team choose the team and the access level and click on Grant Access.